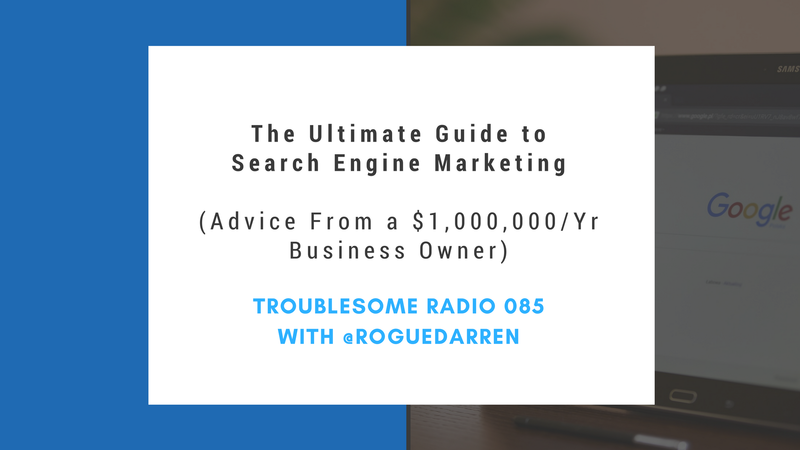 In episode #85 of Troublesome Radio, I welcome my friend Darren back to the show to chat about SEM (Search Engine Marketing). If you haven't heard Darren's appearance way back on episode #24, go give it a listen. In episode #86, we dive into an hour-long show about how he's made a bucketload of money on trading crypto currencies this year---you won't want to miss it. How offline and online business works very, very differently---people are willing to spend a lot of money. How much do you have to expect to spend to get any good data? ...finally, is all of this beyond the guy who just wants to make a few bucks from his blog? As a side note, and I forgot to mention this on the show---if you're looking to get into Search Engine Marketing, many of you who have signed up with Bluehost or other web hosts will have a credit (usually $100-$200) for ads on Google or Bing. But for now, enjoy the show! PS: Pro Niche Site is launching on June 28th. For early-bird access and prices, go here. PSS: If you like Troublesome Radio, you’re in for a damn treat. This summer, I’ll be launching the Nomad, Nerdy, and Dirty Show. The premium video podcast series regarding everything nomadic life and online business. Click here to get on the wait list.